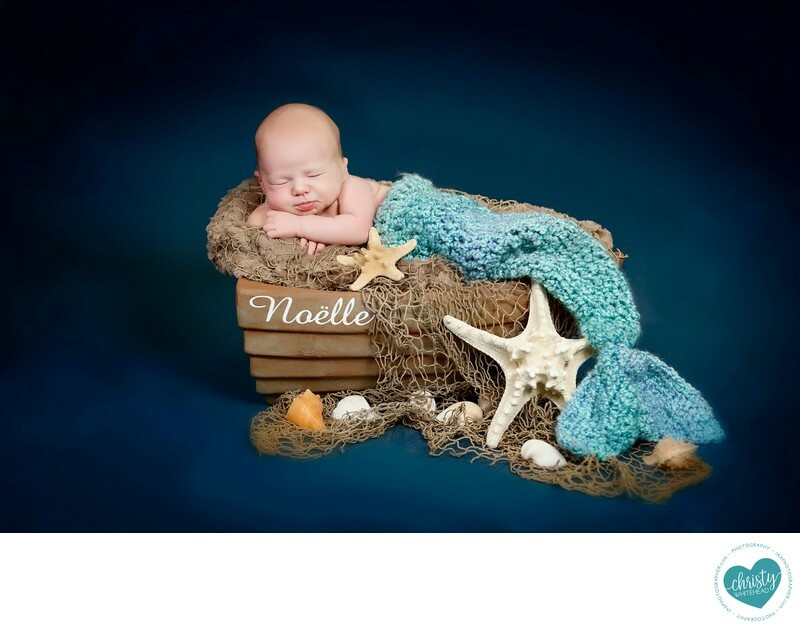 Newborn Baby In A Mermaid Tail On A Tiny Boat JAX - Newborn Photography | Schedule Your Newborn Shoot Today! In centuries past, the ocean was thought to be full of krakens, sea serpents, sea monsters, mermaids and other fantastic creatures. Even Christopher Columbus claimed to have a mermaid sighting of his own off the coast of Florida; little did he know that this was actually what would be the first written record of manatees in North America. While it was eventually proven that mermaids do not exist, the folk lore had already sunk it's roots into seaside communities across the globe. Most Florida natives and transplants can't help but fall in love with the sea and all it's legendary lore - a favorite of those being mermaids. When this momma found herself transplanted in Jacksonville she was no exception. She wanted mermaid theme newborn photos and I was happy to oblige! Mermaid photoshoots are a popular request in Jax so I already had a boat, tail and shell props in my studio. It's actually one of three boats we have here in the studio! Although, we did order the name for the boat as a special request by mom. I'm always looking for ways to make each newborn session special, unique and reflective of the family who books photography through our Jacksonville Studio.